Bill hid in a hollow tree on a rocky knoll in a field of oats for three days without food or water, literally hiding in plain view of the searchers. Under cover of darkness, he slipped away. He moved unseen through the forest, eating whatever wild food he could scrounge. He stole a canoe from a farmer and paddled home after three weeks in hiding. (Bill's men had already returned home under a mutual parole of prisoners.) He put another crew together and was out spying again the next day. Late summer in 1814, Bill set up an ambush on the Canadian side of Lake Ontario near Brighton, on the main road between Kingston and Toronto used by military dispatch riders. When the westbound rider came by, he jumped out, pistols in hand. He took the rider's weapons and satchel of dispatches, shot his mount, and sent him home on foot. And then he waited. An hour later, a dispatch rider came from the east. Bill relieved him of his dispatches and sent him home on horseback. When he returned to Sackets Harbor, they discovered one satchel contained plans for another raid on Sackets Harbor. With their plans revealed, the British canceled the attack. By September of 1814, the war on Lake Ontario had stalemated. Both sides were building bigger warships, hoping for naval superiority. The British had almost completed the St. Lawrence, the mightiest craft on the Great Lakes with 112 guns (larger than Lord Nelson’s famous flagship HMS Victory). Bill joined a crew of five and crossed to Kingston one night in two boats. 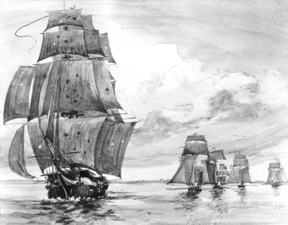 They sneaked into Navy Bay in the shadow of Fort Henry, their mission—sink the big ship. One boat contained a primitive mine, which they intended to attach to the warship and detonate. To their disappointment, the St. Lawrence had sailed away with the fleet. When the war ended that winter, the British removed her guns and left the great ship to rot. Following the war, Bill and his growing family settled for brief periods in several New York towns. He struggled to regain some of the prosperity he had before his exile from Canada. He moved to Clayton in 1834, his home for the remainder of his long life. He established a shop on the waterfront and lived a few blocks away in a house facing the river. He continued smuggling to Canada while also working for the US revenue service. In a ironic twist, his job was to spy on Canadian smugglers coming into the US. Finally, prosperity returned. But, in 1838, Bill Johnston once again risked his comfortable life for a good cause. More on that soon. Note: The next few posts look at other raiders and rebels who disturbed the border peace in early 1838. Benson Lossing's 1869 book, Pictorial Field-Book of the War of 1812, is available online. Material on Bill Johnston, based on interviews with the elderly pirate, appears in Chapter 29.